The ReferenceBoss Toolbar is a free browser extension that offers quick access to Wikipedia, Dictionary.com, and some other database-like websites. The browser is owned by Mindspark Interactive Network, which is notorious for a wide variety of interactive toolbars for the most popular Internet browsers. The official website referenceboss.com suggests that the ReferenceBoss Toolbar works on Internet Explorer and Mozilla Firefox, but our researchers have found that the program is compatible with Google Chrome, too. If you want to remove ReferenceBoss from the computer, keep on reading to find out how to do it in no time. Mindspark programs are themed browser add-ons; hence, they may seem to be very appealing and useful. However, it is essential to pinpoint that Mindspark applications are powered by ask.com, which is an advertising-supported search engine. Those computer users who install the ReferenceBoss Toolbar or any other extensions of Mindspark without paying attention to the installation process may think that their browsers are hijacked when they find that the settings of their browsers have been changes. The truth is that the installer of the program offers the user to change the home page and search provider to ask.com, and, if you are one of those careless users who want to get rid of the ReferenceBoss Toolbar extension and browse the Internet as usual, take action right now. You should be careful with the search engine ask.com because this search engine generates various sponsored links in order to enhance your browsing behavior. All those additional links are supposed to be related to your search terms, but we advise you against clicking on them because some of them may have nothing in common with your search query terms and interests. Ask.com attempts to provide relevant sponsored links, but you should be alert to the possibility of being provided with unreliable links. If you do not want to be lured into visiting questionable websites, take some preventative measures. You should also bear in mind that the ReferenceBoss Toolbar, as well as the search engine, records certain non-personally identifiable information in order to understand your browsing patterns and enhance the quality of the service. Mindspark records personally identifiable information only when you provide your personal details voluntarily, but bear in mind that the search engine may accidently record some personal information, depending on how you browse the Internet. 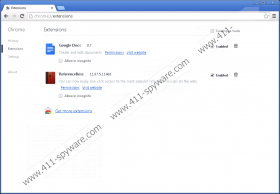 In case you do not want to use the toolbar and search provider, remove them from your browsers. Below you will find our step-by-step removal instructions which should help you uninstall the unwanted program, but our advice is to implement a powerful anti-malware program. 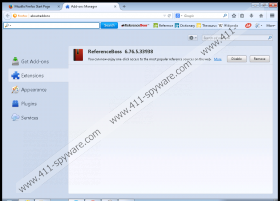 Use SpyHunter if you want to have the ReferenceBoss Toolbar removed and the system protected against malware and spyware threats, such as Trojan horses, browser hijackers, adware, ransomware, and other threats. 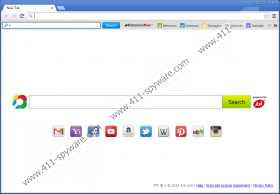 Click Search Providers on the left side of the window and set a new default search engine. Change the home page on the General tab. Click OK.
Close the tab and click the search engine icon next to the search box. Select your new default search provider. In the On startup section, select the last section and click Set pages. In the Search section, click Manage Search Engines and select a new search provider.